I’ve not kept this blog up to date as I planned to do. I was going to document my building of a Mostly Printed Computer Numerical Control machine (aka MPCNC) over winter break 2016-2017 and here it is already March 2017 and not a word about it. Let’s catch up. A CNC machine is a very precise machine with a cutting tool attached for milling. This particular CNC can accurately mill semi-soft materials such as wood, Corian countertop, acrylic, and possibly aluminum from a computer generated 3D design. 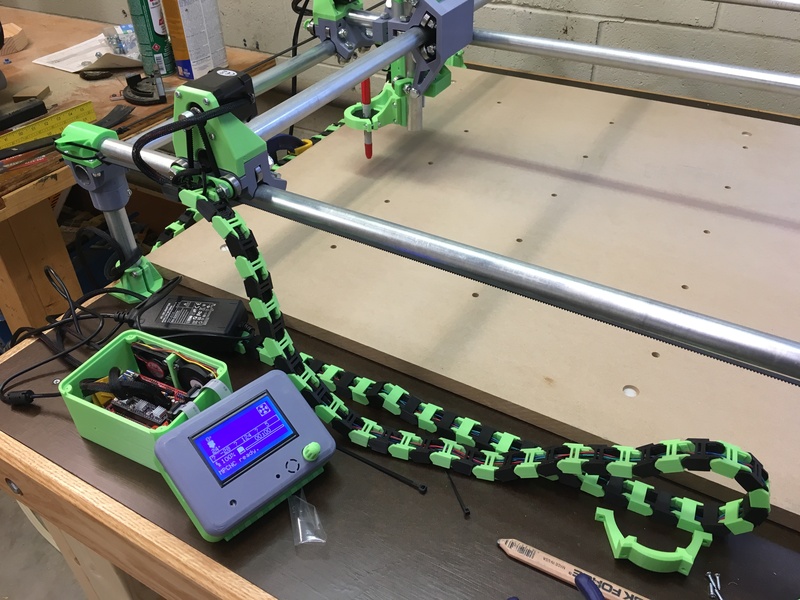 The MPCNC is designed to be simple and inexpensive by printing most components with your home 3D printer and assembled with common hardware. Standard electrical EMT metal conduit and 308 skateboard bearings make up the rest of build. A Dewalt trim router provides the cutting power. Here are a few pics of the assembly. 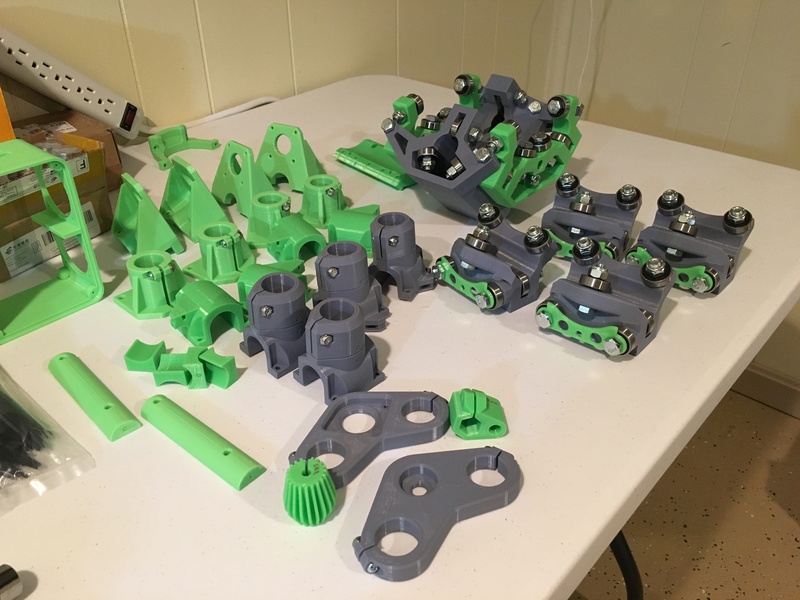 All the 3D printed MPCNC parts. 200 hours of printing! RAMPS 1.4 and Arduino controller testing. Final set up and router testing. I’ve already completed one project with it. 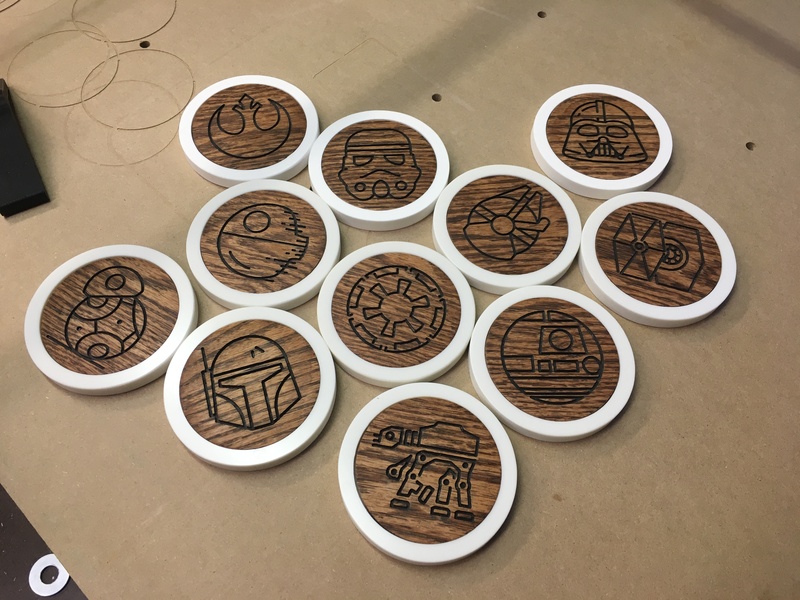 A set of Star Wars coasters made from Corian countertop and 1/4″ oak. The MPCNC is a modular design with interchangeable toolheads. The attached video shows Phase II of my build. 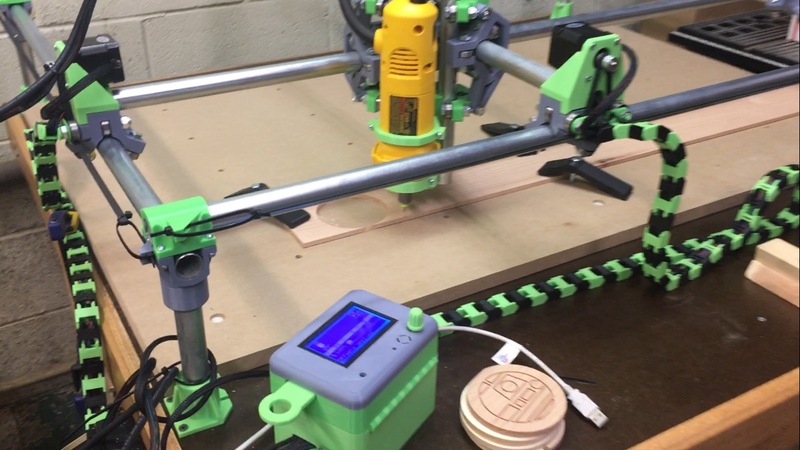 This involves swapping the Dewalt router for a 2.8 watt laser diode for engraving and cutting. Phase III will be a drag knife for cutting vinyl decals. Phase IV will be a needle cutter for foam core board. Phase V might possibly be a 3D printer head. The video shows the Death Laser engraving the Evansville Bourbon Society logo into a piece of bourbon barrel oak stave. This stave was taken from the society’s 2014 Inaugural private barrel selection of Four Roses. After engraving the stave will be turned into a shot glass/glencarin glass/tasting board/display piece. Note: vector cutting at 250 mm/min at 78% power. I love the grey and green, If I make an update I think this has to be the new colors, hope you don’t mind. Nice build thanks for sharing it.